August is here and I am thoroughly enjoying flipping through the latest fashion magazines to see what is new for Fall ’14. I love this spread in W so much, it is actually making me long for sweater weather! Okay, okay…I’m not ready for summer to be over just yet, but I am working with tweeds and wools so that I am ready for the crisp air of fall. 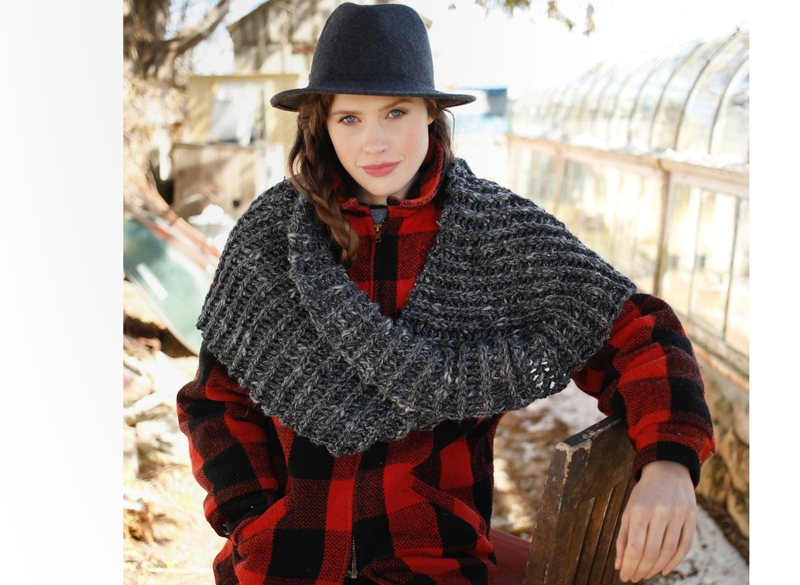 I love voluminous accessory like Bantry, the cowl featured in booklet #346. Bantry is made in Berroco Inca Tweed and looks like a big fisherman’s rib but it is actually crocheted! Many of you have asked, is there a knit pattern as well? And the truth is, not really. Yes, you could easily make a beautiful fisherman’s rib cowl with this yarn, but we found that the definition we got with the front post double crochet technique was more exaggerated and just what we were looking for. I encourage everyone to try this crochet technique and I promise, it’s easy to learn! Once you crochet one row, you will have the pattern repeat down and will have a stunning fall accessory in no time. Follow along as I demonstrate the pattern stitch for Bantry. I hope this helps those of you who are curious about or new to crochet.